To perform is to engage with something worthy of your attention. Read this One Ball post offering a creative and colorful pathway to full and authentic work/employee engagement. Effortless virtuosity. The world’s greatest rhythmic gymnasts perform incredible ball routines. They dance, move, balance, and demonstrate mastery, originality, and virtuosity. They achieve this with what appears to be effortless performance because they are so graceful. How routine is your best performance? How well do you focus and flex with The One Ball? Defining performance. 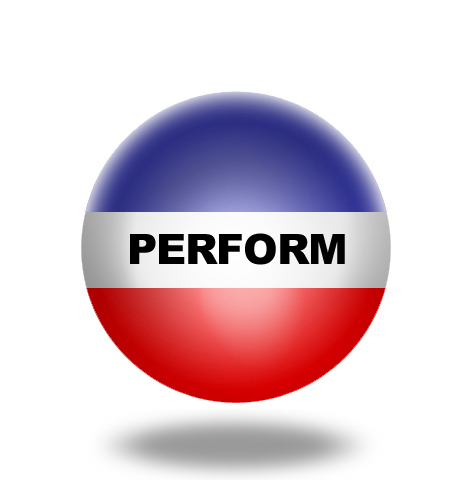 The best definition of performance I know is quite simple: Performance is anything worthy of your attention. You don’t have to be in public to perform, other people don’t need to know you are engaged in performance, but you have determined that something is worthy of your attention — writing a report, meeting with a co-worker, creating a presentation, delivering a presentation, meditating, spending time with someone you love, or walking the dog. These are all performances! What kind of performer are you? What is most worthy of your attention at work? Text tossing? How present are you to your performance? Imagine a rhythmic gymnast pulling out a cell phone in the middle of a routine or taking time to text as she tosses the ball in the air. The notion is ludicrous yet how often do we end up diminishing our performance by multitasking. We believe we can juggle more and more and that if we just keep the balls spinning we are really getting some place. While there is a place for what is commonly called multitasking, the notion that is as effective as single tasking is wrong. When what you are doing is important, multitasking is a practice to be avoided. Just think of it as playing tennis with two balls. Just noticing. Become more mindful this week of how often you engage in single tasking. How long can you sustain your single-mindedness? What were the benefits and challenges of single tasking for you? Lengthen your time on-task. When you begin to notice how long you can be on task with a single performance see if you can stretch it out ever so slightly. Work at moving from initial engagement to sustaining engagement over increasingly longer periods of time. Open just one window. Work with just one window open on your computer. How often do you have so many windows open that you begin to feel a draft and get blown right off the course you had originally set for being on the the computer. Stop light stress. When you stop at a red light do you stop, pause, and refresh or do you impatiently wait to get going again? Can you stop in traffic even for 40 seconds without becoming impatient or quickly trying to make a phone call? Be kind to yourself. I believe so many of us have been multitasking for so long that it will be a challenge to work towards more single-tasking. (For example, while writing this post I just noticed that I had 4 windows open on my computer and it was so tempting to try and watch another You Tube video while also writing this. When you catch yourself losing focus on The One Ball – simply accept this has occurred and gently bring yourself back to your One Ball performance. Be inspired. Watch Inna Zhukova perform a silent ball routine. As you watch her perform think about how you can work more effectively, efficiently and gracefully with your One Ball. Next. The next One Ball column will help you determine your most important performance(s).